We are up to Week 10 in my course and we have looked at all sorts of ways sustainability has been communicated, and currently the focus is on film and documentaries. There are many more that I want and need to watch including all of the Years of Living Dangerously TV series, The Economy of Happiness, The Corporation, Trashed, Baraka…and there are others…but I shall revisit those here, if warranted, as I get through them. The documentary I watched today was The Age of Stupid (TRAILER: http://www.youtube.com/watch?v=DZjsJdokC0s). If I had watched it in 2009 when it was produced I would have been very moved and indeed probably agitated into commencing my sustainability journey earlier. 1: What rock was I under in 2009 that I did not even KNOW about this movie? 2: We have done very bloody little in the past 5 years to seriously address climate change, and here in Australia we have probably retreated in our efforts to fight climate change in any meaningful way. This doco is well worth watching—pitched as if looking back to the turn of the 21st Century, it reports from 2055 as to how things unfolded, following a number of story lines in parallel from different parts of the globe. I have to say I had total WTF moments where I just could not believe the irrationality of some of the real life participants. Highly commended, albeit a bit on the depressing side if you, as I, feel frustrated and cranky about how sustainability issues including climate change appear to still be without any tangible traction. OK Dear Reader, I am back to the blog! And yes, I know it has been a while, but this semester I hope to keep on top of things a bit better on a weekly basis, as a journal of stuff that is my passion: sustainability. Since my last post I have had three amazing experiences. The first was to do a small presentation to the Innovation and Sustainability Centre at USC on our backyard veggie garden and aquaponics system. It was a bit nerve-racking but the PowerPoint held together and people asked questions at the end, so all good. 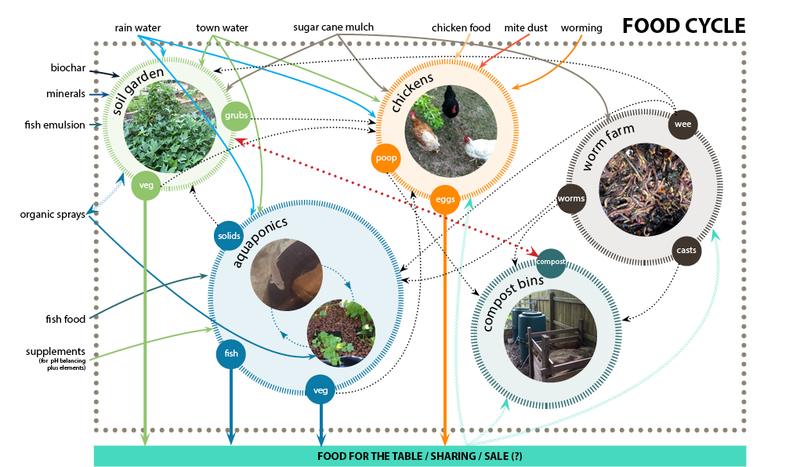 As part of the presentation I developed a systems diagram of the inputs, outputs, throughputs and loops that happen in the backyard of our small suburban block. It looks messy (you should see the actual garden!) but it shows how we blend and interface, where we can, all component parts. The second amazing thing was that I was asked to help critique the first semester course I had just completed: SUS101. What a privilege! The course was such an eye opener in so many ways and has encouraged me to pursue some of my bigger (sustainability) passions, which include food and consumption. But being asked to feed back into that course (which had just been reworked and rewritten) allowed me an opportunity to ‘play it forward’: to contribute so that, I hope, the next cohort gets even more out of the course than I did. So onto this semester and what it holds! SUS202 is Communicating Sustainability. It’s a big area and I am hoping to find some answers. Why are we still having the global warming ‘debate’? Why, when Rachel Carson wrote and published Silent Spring in 1962 are we still poisoning our planet (in more ways than I can even conceive) 50 years down the track? Does the allure of money make us mute to speaking for our environment: that which will sustain us? Is there a silver bullet, a way that what should be heard, will be heard above the almighty din of disinformation? In this first week we have been set reading tasks and also invited to watch a TEDTalk: Mark Pagel, a biologist whose topic is ‘How language transformed humanity’ [20 minutes: see: https://www.ted.com/talks/mark_pagel_how_language_transformed_humanity]. It is indeed interesting stuff, but I get it, that we have language and have been able to cooperate and communicate and refine ideas is peculiar to our species. That language divides and unites us at the same time is confounding. That language can be used to subvert and empower us is equally perplexing. Would one language solve everything? I go with no, but will let you be the judge. Polished and produced…well worth the watch! Hollywood celebrities and respected journalists span the globe to explore the issues of climate change and cover intimate stories of human triumph and tragedy. Just in, a video just in from the Climate Council, I guess in response to the IPCC report. Rising power bills from using your airconditioner: With temperatures set to rise between 0.6 and 1.5 degrees by 2030, your airconditioner use will become a significant expense. On the plus side your heating costs will most likely go down. Heating and cooling account for 15 to 25 per cent of a typical Sydney household’s electricity use. Warmer temperatures overnight: Pack away your doona as evening temperatures are also predicted to increase in the future. Since 2001, extreme heat records at night have outnumbered extreme cold records by 5 to 1, which may make sleeping more difficult for some. Crowded beaches: Rising sea levels will put extra pressure on our beaches. Storm surges will continue to cause erosion, adding to the reduced shoreline from higher sea levels. Where will you put your towel? High-speed windscreen wipers: Rainfalls are likely to increase in intensity. This will mean more flash flooding and need for the high-speed setting on your windscreen wipers as short, sharp downpours become part of life. Infrastructure chaos: City infrastructure struggles at the best of times but you can expect more rail outages due to extreme heat, water shortages due to failures in treatment plants from bushfires or floods and airport delays due to storms. Going on a holiday? You better visit some of your favourite local attractions soon because many won’t stay the same for long. Ocean acidification and rising temperatures are expected to have a significant effect on the Great Barrier Reef. The Gold Coast has been identified as a hotspot of vulnerability due to the concentration of coastal development. The Kakadu wetlands may be subject to increased saltwater intrusion from higher sea levels, affecting the delicate balance of the ecosystem. Increases in food prices: If the driest future scenarios eventuate, there will be increased pressure on the Murray Darling Basin – where one-third of our food supply is produced. How does your garden grow? If you’re a green thumb, you’ve probably noticed changes to the flowering time of some plants. Warmer temperatures mean some species will bloom earlier and for longer, while other plants will wither and die in the heat. Last year in Sydney, the magnolias came into bloom about four weeks earlier than usual due to the mild weather. High fire danger: The number of days with very high and extreme fire weather is expected to increase. In Sydney the extreme values of the fire danger index have increased by about 2 per cent per decade over the past 30 years. Implications include increased building costs in bushfire risk zones and more pressure on already stretched firefighting services. Staying out of the heat: An increase in heatwaves will most likely result in more admission to hospital and deaths from heat-related illnesses. In the 2009 Victorian heatwave in the week before the Black Saturday bushfires, the number of emergency call-outs to ambulances in Melbourne increased by almost 50 per cent over the three hottest days. And Australia is the only country I know, where climate change has been made into ‘a political football’. We are in the process of rescinding the main tool of carbon abatement—’axing the tax’—the carbon tax—as established with the previous federal Labor government. The new federal LNP prefers a market based solution, where it seems like we will buy the polluting habits from the worst polluters—AKA direct action. It’s a farce and realising what is our rather meagre CO2 abatement target of 5% is indeed questionable. And on the question of adaptation—AKA let’s stop focussing on the main problem and ready ourselves with a stack of bandaids? I am a bit lost for words. Yes we should engage with what may very well be the fallout of climate change—rising sea levels, food insecurity, readiness for severe weather events, and so on, but to make this the focus instead of addressing the main issue is just lunacy. This in a week where we are still looking in the oceans south west of Perth for Malaysian Flight MH370—where from the air we are spotting significant objects that keep on turning out to be huge (and not so huge) chunks of floating rubbish. Yes people, the Great Pacific Garbage Patch—or gyre—has a growing cousin in the Indian Ocean. What is your personal carrying capacity for grief, rage, despair? We are living in a period of mass extinction. The numbers stand at 200 species a day. That’s 73,000 a year. This culture is oblivious to their passing, feels entitled to their every last niche, and there is no roll call on the nightly news. There is a name for the tsunami wave of extermination: the Holocene extinction event. There’s no asteroid this time, only human behavior, behavior that we could choose to stop. Adolph Eichman’s excuse was that no one told him that the concentration camps were wrong. We’ve all seen the pictures of the drowning polar bears. Are we so ethically numb that we need to be told this is wrong? There are voices raised in concern, even anguish, at the plight of the earth, the rending of its species. “Only zero emissions can prevent a warmer planet,” one pair of climatologists declare. James Lovelock, originator of the Gaia hypothesis, states bluntly that global warming has passed the tipping point, carbon offsetting is a joke, and “individual lifestyle adjustments” are “a deluded fantasy.” It’s all true, and self-evi­dent. “Simple living” should start with simple observation: if burning fossil fuels will kill the planet, then stop burning them. 9. NASA … now there’s a credible source! I get so tired of some of the people in my circle of friends who deny that the climate is changing because of anthropogenic (human) input. They say that the science is not in, and that even though 97% of climate scientists say they are certain of the effects of humans and that there has been a significant increase in the amount of CO2 in the atmosphere, that is still not enough evidence. And then the go on to cite some totally un-credible site. The science is not in?I am sure that if 97% of specialists had diagnosed them with a particular medical condition they would be accepting of it … and doing something about it … like maybe modifying their behaviour or working like hell to find a cure. I would. I like their comment about ‘growth’, and that even at 2% (which is a small and easily criticised growth level by anyone in opposition) this is still exponential growth! No system or organism on this planet grows without limits, except cancer.